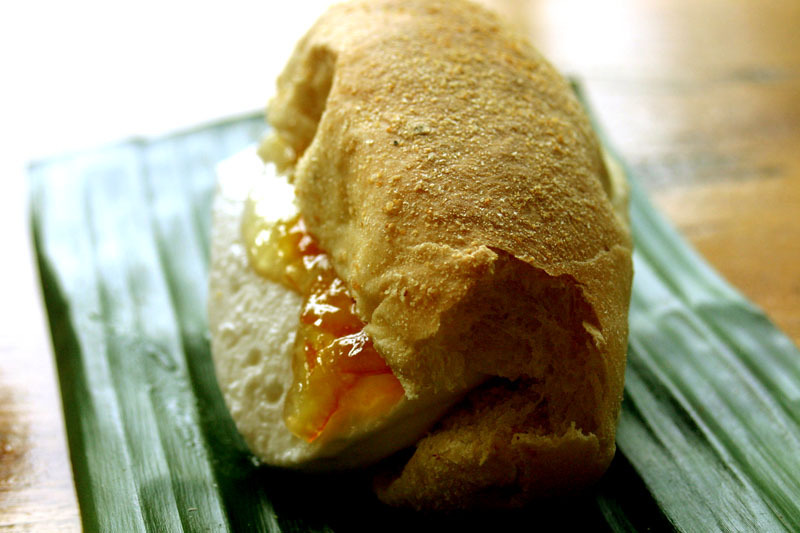 No breakfast or snack time is complete without a serving of freshly baked pandesal. We can spread our favorite jam, sandwiched a fried hot-dog on it or simply enjoy it as it is dunk on a hot coffee or hot chocolate.. Truly a versatile bread! Dissolve the dry yeast in warm water. Let it stand until bubble comes out and doubles in size approximately ten minutes. This means that yeasts are active. You can prepare this in advance and keep this covered in a place without too much heat, wind or cold. Set aside and ready for future use. In a bowl put the warm water, egg, sugar, salt and melted butter. On your table put the flour make a small well in the middle and pour the water, egg, sugar, salt and melted butter mixture. Mix them well. Add the active yeast. Knead them well for about fifteen minutes make a ball form and let it stand until it doubles in size. Do your second kneading. Wait until the dough becomes elastic it means that the yeast is working well. You can powder your hands with more flour if it becomes sticky. Cut 40 portions of this dough and form a shape of pandesal. Round elongated and a bit flat on the top. Line them up with spacing over a parchment paper. Let them rise for about 2 hours again. Before bakign them spray the top with water to ensure a crispy crust and powder it with breadcrumbs. Preheat the oven at 200° celsius and bake for about 20-25 minutes. If you are using a bread machine, use your machine to do the two first kneading. Once they are baked dust them with some bread crumbs. Hi I want to try this recipe but I’m quite confused, am I going to add the milk, sugar and butter in the yeast dissolved with water? Please help I really want to try this recipe thanks! hi I ust want to ask something cpz i really want to try this recipe, am I going to add the suger, butter and milk in the yeast dissolved in water? please help me! thanks! Hi Pretty, yes you have to add the milk, sugar and the melted butter into the yeast dissolved in water. The rest is very straight forward. what kind of milk? evaporated milk or condensed milk or powdered milk??? When are you supposed to use the egg? may i verify.. your procedure here says after kneading the dough.. to cut it into 24 portions right away and let rise for 2 hours?? okay na ba yan? i mean, kasi po, with the other pandesal recipes i’ve tried to check, they have twice rising time.. First time is after kneading the dough, form into a ball and let rise, covered with damp towel.. rest for about an hour and the second time is after the dough is already cut and dusted with bread crumbs.. Pwede din ba un sinabi niyo here na once lang but wait for 2 hours?? same lang sila?? will try that as soon as i hear from you. Many thanks for sharing. God bless po. Combine flour, sugar, salt ( dry ingredients first) yeast in lukewarm water till its bubbly..
Hi, I made try the pandesal there were nice pero kapag kinabukasan na matigas na yong bread. Bakit po ganon? Viva, that’s the nature of pandesal . It gets hard the moment it as cooled down.